Trooper Joel Davis was shot and killed in Theresa, New York, while responding to a domestic disturbance and shots fired call at 34371 Route 46. At some point during the incident the male subject murdered his wife and wounded another woman who lived on the property. 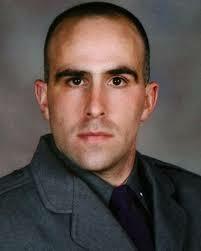 Trooper Davis was shot and killed after arriving at the scene. The subject, an active duty Army member, surrendered as additional units arrived at the home. Trooper Davis had served with the New York State Police for four years and had previously served with the Jefferson County Sheriff’s Office. He is survived by his wife and three children.